I’m actually feeling a little meh today, so I went home early from work. The best thing about feeling meh (and having a massive muscle ache because of horseback riding) is that you get to read on the couch with a blankie and a kitteh cat or two. 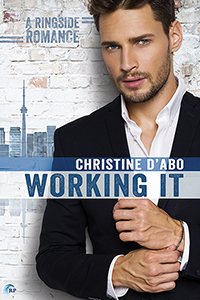 Today’s reading is of Christine D’abo’s Working It. A review book actually which I got through Netgalley. I’ve only started the first few pages, but it looks promising. Now that’s me. What are you reading?